The moment Brian Cook knew something special was happening before his eyes. THE LITTLE GIRL WANDERED THROUGH THE HALLWAY. Many of the photographs on the walls were of grownups, people she didn’t know, and were in black and white. But her dad seemed interested, so she looked around, too. Then she came to a glass case. A nice-looking man was cradling a trophy, a bright smile creasing his lips. There was a lot of other stuff in the case, including a golf bag much, much bigger than hers. Something about this spot made her stop. Her dad saw her stop. And he quickly grabbed his phone. This photo would be color, but it too captured a moment in time. Mimi Cook liked golf already. But Brian Cook saw something else. Brian saw that his daughter Mimi was beginning to like Pinehurst as well. BRIAN IS A GOOD GOLFER. He’s been known to break 80 on a quiet, solitary walk around Pinehurst No. 2 with just a single caddie and the sunrise. But it’s not the golf itself that draws Brian to Pinehurst. It’s more than that. What that is, specifically, can be hard to place sometimes. But it’s in the Village Chapel chimes and the slow drive to The Carolina Hotel. It’s in the rocking chair on the veranda and the cocktail before dinner. It’s in the Cook family. This is where Brian proposed. He had left the ring in the 18th hole of No. 2. The bended knee, smiles and tears came in quick succession. LIKE ANY DAD, BRIAN HOPED HIS CHILDREN would play golf. His dad handed the game down to him. Golf always made conversations and feelings and hopes easier to come by. Mimi got hooked early, and soon, too, did her younger sister Reese. They play as a family, just as Brian hoped they would. They even tagged along with Brian and the caddie at sunrise. For the girls, it’s not just the golf at Pinehurst, either. There are the pools, the rides at the 4th of July festival and the Easter Egg hunt. It’s the nachos and the Putter Boy Pasta at the Ryder Cup Lounge and the milkshakes at the Deuce. But, make no mistake, it’s the golf, too. Mimi Cook and her dad Brian at the 2014 U.S. Women’s Open. BRIAN BROUGHT MIMI TO THE U.S. WOMEN’S OPEN on No. 2 in 2014. He had taken her to the LPGA Tour’s event in Williamsburg, but this was different. This was bigger in every way. The grandstands. The people. The championship. It was also Pinehurst, and Mimi knows Pinehurst. In 2014, phones and cameras weren’t allowed in the gallery. But Brian knew a media guy, and asked if a picture were possible. There, in the glaring June sun with the 18th hole and Pinehurst’s clubhouse in the background, Mimi squints a smile next to her dad. Father’s Day was just four days before. Mimi and Reese Cook at The Cradle at Pinehurst in March 2018. MIMI KEEPS GETTING BETTER AT THE GAME. So does Reese. Mimi went to a sleepover golf camp at Penn State last summer and ate it up. She can play. She can also compete. 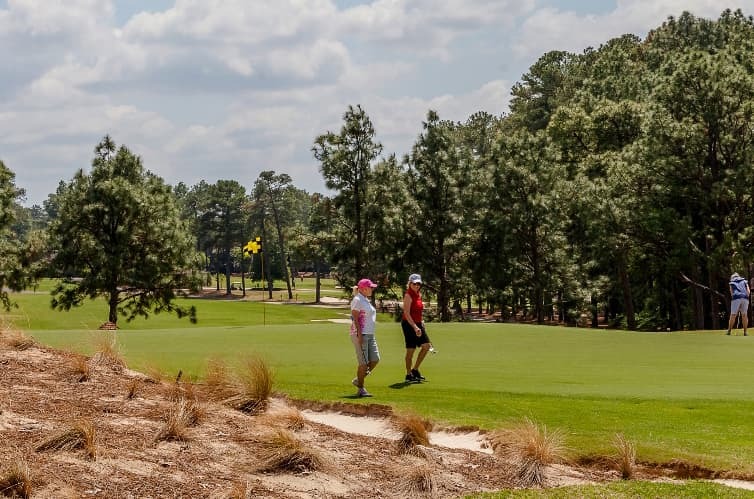 It’s nearing Spring, and the Cooks find their way back to Pinehurst again. This time, they tee it up on The Cradle, the new short course. On the 57-yard 3rd hole, nicknamed the Punchbowl, Mimi knocks it stiff. She buries the 3-footer for birdie, her dad can only muster par, and her day is made. “I beat him on one hole,” Mimi beams proudly. Every day at Pinehurst is Father’s Day for Brian Cook.